At the Monday, January 30th Information Meeting, Sue Roust, Interim City Clerk, presented public input research she collected through contacting various jurisdictions used by the HR Department for salary benefit comparisons. Roust stated that Sioux Falls' community standards are towards much more openness and public input than most other places. Requirement to sign up in advance. Allowing public input on non-agenda items. Allowing a response to a citizen comment/input. When should public input be allowed on a public council meeting agenda? As Roust said, Sioux Falls city government and the SF School District lean towards more openness and public input than most other jurisdictions she looked at in her research. Some jurisdictions require sign up before the meeting starts; one jurisdiction requires a citizen to fill out a request by Wednesday Noon before a Monday council meeting. Omaha, Minneapolis, St. Paul, and Bismark don't allow public input on non-agenda items. Sioux City allows public input at the end of their meeting. Cedar Rapids allows public input after a public hearing. Councilor Jamison asked for information regarding Aberdeen and Rapid City which was left off the research because it was not on the HR comparability list. I went out and looked at these two websites. The City of Aberdeen provides an open forum from 5:30 p.m. to 5:40 p.m. which occurs after the Proclamations and before the Consent Agenda approval. The rules for the Open Forum are printed right on the agenda. It says that the Open Forum provides an opportunity for the public to address the city council with concerns, questions or comments on items which are not on the agenda. They have sign up prior to the start of the meeting. A majority of the council can agree to extend the time period. Presentations cannot exceed two minutes in duration. The forum cannot be used to make personal attacks, air personality grievances or make political endorsements. It cannot be used as a time for problem solving or reacting to comments made. The City of Rapid City allows for General Public Comment after the adoption of the agenda and presentation of awards and recognition and before the consent agenda. The official agenda states it is a time for members of the public to address or express concern to the council on any issue not on the agenda. Conclusion? It depends on the community and the standards that jurisdiction wishes to impose on its citizenry. You can research jurisdictions all over the country and come up with variations on how local government handles public input. What is important is what level of open government do you want in this community? Elected officials, in my opinion, set standards on public input based on a tolerance scale. That is, their own tolerance scale. They can tolerate public input as long as it does not address a concern or criticism about their own actions. Councilor Karsky stated he advocates looking at adjusting the public input standard and wants to put public input at the end of a council meeting because he is concerned about all those city employees and those who come to speak to a specific agenda item. Councilor Jamison stated it should be looked at to make it better. Councilor Rolfing asked the topic be sent to the next working sessions so they all could discuss it more fully. When you start making rules to censure public input, you start down a path that is going to create controversy and dissent. It is a slippery slope fraught with charges of tampering with free speech and openness and transparency in government. The public input provision may make some elected officials uncomfortable. So what? When you become comfortable and no one is allowed to speak up and challenge an elected official is when democracy takes a back seat to good government. What should be the community standard for public input? I think we have one already and as Interim City Clerk stated, our community standards are towards much more openness and public input than most other places. What is wrong with that? The Charter Revision Commission met on Friday, January 27th. The most interesting part of the meeting was the public input and the commission responses. Commissioner Gregerson said at one point that while serving on a past CRC, they begged for input and never got it. I submit to you that the public is more engaged in their city government goings on than ever before. We should probably thank the current mayor for that. He encourages public input with his ever present press releases and press conferences. The mayor is before the city council at many information meetings presenting his proposals and agendas. This mayor is in the forefront of city government with little public input or presentation by city directors. He is the main mouth piece of the executive branch and his demeanor and manner of speech encourages public input. His mere presence moves the public to engagement. Encouragement to take the necessary time to research and discuss proposals before taking hasty action to put something on a ballot. Transparency in government is a good thing and should always be the primary purpose of revisions to the city charter. Premeditated use of Roberts Rules of Order to shut down public input is an abuse of power. Balance of power and checks and balance between the executive branch and the legislative branch of government must be preserved at all cost. Respect the people that come before this body. Don't have time limits. If you only want to commit to one hour per meeting, do so with the understanding that you must have more meetings in order to discuss and research issues and proposals. In other words, take your time. Commissioner Aanenson, who probably took more of the heat for his behavior at the last CRC meeting, felt the need to respond to citizen Andy Traub relating to his comments about political contributions and using Roberts Rules of Order to shut down public input. Commissioner Aanenson stated in part: "I would apologize to Mr. Jamison but when I'm asked to come on a commission and donate one hour of my time and the time is running into an hour and a half and I have previous engagements, and if it was meant that way and I know you are referring to me that I didn't mean to cut off Mr. Jamison, I just didn't have time for that meeting...."
Not much of an apology to Mr. Jamison. Let's remember he is Councilor Jamison, a duly elected member of the City Council whose standing should have demanded proper decorum from this commission than what he got. This was more like a justification for his behavior. He just didn't have time to waste on such matters. He's a busy man. Then Commissioner Aanenson went on to attack the media for reporting on his donations to the mayor's campaign and he admonished them for not reporting the whole story. Commissioner Knudson became emotional and Commissioner Thimjon thought people jumped to conclusions. I am always of the opinion that if you have to spend time justifying your actions and making counter attacks, there is red meat in the background. Commissioner Gregerson just wanted to start over. To Councilor Jamison's credit, he offered to remove four of his proposals from further consideration to help this group out. He never rose to their level of behavior and kept his cool both when he was dissed very publicly by this group and when he came before them again at this meeting. Always the professional, level headed and calm. Good traits for a public official. To be fair, Commissioner Aanenson and the other commission members are citizens who volunteered for this public service and like everyone else who said it, we all thank them for their willingness to serve. But that being said, they have a duty and an obligation to LISTEN. I have to wonder what sort of orientation session these novices got before they held their first public meeting. It would appear they got nothing by their actions. Surely, the city attorney's office could have done a better job preparing them for their duties and responsibilities. Maybe we would have been spared the unprepared and not very professional behavior exhibited in the past. This is not about them. This is not about whether they have time or not. This is not about their personal opinions or thoughts. Just because you talked about a proposal, doesn't mean you immediately look for a motion to put it on the ballot.This is about them taking public testimony and input regarding the city's charter and deciding through deliberate study and research what should be presented to the public in ballot form for amendment to the city's governing document. This is not about them. We are talking about them, because of their inappropriate public policy behavior. We are talking about them because of their rush to get things done without proper thought and deliberation. We are talking about them because they don't know how to handle the business of a CRC and sometimes don't even understand their own motions and what they are voting on. No one caused this controversy but them. Justifications for political contributions is like trying to close the barn door after all the cows left the barn. It's too late. Insincere apologies because you are very busy and didn't have time is a personal problem and has no place in the important business of the Charter Revision Commission. Damage done. The time is to move forward, hoping they all learned an important lesson. It's about doing the people's business. It's not about them. That means it's time to listen, take input, study, research, seek the advice of the city attorney, and draft language for ballot consideration either this year or in two years hence. So you got criticized, so what? That's what happens when you volunteer for a big, high profile job like this one. It's not about them and they need to get over themselves. And yes, they need to find time in order to do a good job. The South Dakota Legislature is not going to be any different than other Republican state legislatures in this country when it comes to attacking public employees. This state is a right-to-work state and has been for a long time. Unions don't have a foothold in this state except among public employees. Maybe that's because public employees have always been at the mercy of elected officials and historically have wages below a competitive private sector market. The legislature can get away with no raises for state employees because they are the largest employer in the state capital. Where else are all those people going to go work? The employees working for the City of Sioux Falls did not organize until the late 70's and early 80's and organized because of certain employment practices. There were layoffs of general employees, and physical agility testing for firefighters that energized those public sector employees to petition to hold an election to be represented by a collective bargaining agreement. Public employees in SD cannot strike. Public employees in SD do not have binding arbitration. I happen to agree with those two positions. I do not think it is in the public interest to allow public employees the right to strike. Nor do I think public employees should have the ability to go to binding arbitration in a labor dispute. An independent third party should not be able to obligate the taxpayers to any amount of money without the express approval of the elected body of the jurisdiction employing those public employees. However, I do not have a problem with public employees having the right to unionize in SD. I have never been afraid of unions. I have always been of the mindset that private companies and yes, public sector employers usually get an organized effort to unionize when management does not treat their employees fairly or in good faith. Once a union gets into a workplace, it is very hard to decertify that union. I have worked in a unionized setting as a management employee my entire professional career, both in the private sector and in the public sector. Did management and the unions always agree? No. Was it irritating at times to sit at the bargaining table and listen to what I believed were unreasonable demands. Yes, but there was a benefit to sitting at a bargaining table and discussing matters related to wages, hours and conditions of employment in good faith and there were many instances where we were able to find common ground. It is hard to find common ground when unilateral action is taken by an employer just because they can and employees have no ability to discuss issues relating to their employment conditions. Let's be clear. In South Dakota, public employees do not have the right to negotiate their pension benefits. South Dakota law is clear on that subject. It is not a mandatory subject of bargaining. We are not like other states where pension benefits are a mandatory subject of bargaining. It is humorous that the legislature is proposing a new law that says the unions could still represent public employees, they just couldn't bargain for wages, hours, and benefits. What the heck is left to represent and bargain for? The labor laws in this state still side with the employer. Where the two sides cannot come to an agreement, there is mediation conducted by the State. The public employer can still unilaterally implement a disputed labor contract. The labor laws are leaned towards the public employer. To support taking the ability of public employees to sit down at the bargaining table in good faith to discuss issues and to negotiate for wages, hours and conditions of employment is simply not necessary in this state. All this proposed legislation is going to do is inflame and demean the very people who are for the majority dedicated public employees who work without notice and sometimes a non competitive wage to preserve the public safety and well being of it's citizens. This proposed legislation is a waste of time in a state that has historically been hostile to a collective bargaining environment and has the laws on the books at the present time to prove it. Public employers still have the ability to say no and the unions in this state can't do anything about it. So, quite worrying about it by passing this unnecessary law. Another example of a legislature that can't see the forrest for the trees. Another neighborhood in Sioux Falls is in the beginning stages of organizing a neighborhood association. The Whittier, Pettigrew Heights and Cathedral neighborhoods are a good example of what can happen when local citizens come together to be proactive in their little neck of the woods. Living in Virginia Beach, Virginia in my early adult years afforded me the opportunity to become active in my local area civic league. At one point, I was even elected an officer of my civic league. It was a powerful means for me to become familiar with my neighborhood and local government when I bought my own home. We elected officers and had an agenda for each meeting which usually included an invitation to some local public official to come speak regarding issues affecting the community and our neighborhood. The most important aspect of belonging to this organization was the ability to become engaged in my community. It meant volunteering and hard work but it was a most rewarding experience and it made me an involved citizen. The idea of civil leagues or neighborhood associations is not new. The purpose of these groups is to provide a voice for citizens in their local government and neighborhoods. There is no better way for neighbors to meet one another on common ground to preserve the neighborhood peace and safety for their families and become engage in local government issues. The city's planning department has played a significant role in the past in helping citizens realize their potential by engaging them in the betterment of their neighborhoods. The Whittier Neighborhood Association is a model for other neighborhoods in Sioux Falls to emulate. It would be a powerful thing to be strategically organized into neighborhood associations across this city. The city's Planning Department could be the lead facilitator in organizing this movement across the city. Assisting citizens in organizing neighborhood associations by establishing boundaries and identifying means of communication within an association is a proactive approach to civic responsibility and citizenship. I'd like to see this added to the mayor's top 10 projects and maybe see it appear on his Top 10 Accomplishments one year. Engaged citizens mean an engaged and informed community. I congratulate the All Saints Neighborhood in their efforts to better their neighborhood and wanting to become active participants in their community. Neighborhood Associations are a good thing for Sioux Falls!! Will We Ever See A Downtown Railroad Relocation? Project Steering Committee Meeting scheduled in October 2011. Project Consultant to give City Council an update in late November 2011. Public Meeting to be held in late November 2011. Draft EA to be completed sometime next year so the public can look at it. Design phase cannot start until the EA document is completed. Project website is updated at siouxfalls.org/railroad. In other words, real substantial progress was not made in those 90 days from July until October 2011. Finalization of design work is no where near being done because the environmental assessment document draft is not yet completed. No decision has been made regarding the feasibility of the downtown main switching yard and the siding alternative to a new bridge over the Sioux River at the Falls . I could relate to Councilor Entenmen's comment at the October 2011 meeting where he asked for an updated timeline at the November 2011 update. Who's on first, who's on second? Is there anyone on the City Council who is keeping track of this project and what is promised at the Council Information Meetings? Oh, I forgot. They fired their executive research staff person back in September 2011. This project is mired in details and moving milestones. While the city muddles through the site alternatives and the environmental assessment and design work, the federal government will take their money earmarked for this project and put it towards the mounting and strangling federal debt because this earmark shows no real substantial progress since it was awarded in 2006. Let's not forget that little tidbit dropped on the Council back in October 2011. There will probably be a need for additional funds above the federal earmark. Tack that on to the 2nd penny sales and use tax revenue as a future need and let it compete with street construction and maintenance needs and the Event Center debt repayment. Will we ever see the completion of the railroad relocation project? It seems doubtful to me. Phases II and III are no where near being completed today than they were a year ago. The mayor may have accomplished his campaign goal to build an event center but his goal to complete the Railroad Relocation Project sure looks like it is heading towards a failure. And that will be his legacy too. I like it when city government tells the good folks of Sioux Falls what they accomplished each year. Setting goals and objectives, which assists a management team to work towards achieving an end result is good "business acumen." If you read the city departments top 5 accomplishments, you can readily identify their accomplishments. You get to an accomplishment by identifying your goals and objectives. Can you say the same thing when you read the mayor's top 10 accomplishments? The answer is no. These top ten statements are not statements of accomplishments. They are statements of hyperbole. Making a feel good statement about something is not a stated accomplishment. Each department outlined their top 5 accomplishments for 2011. Why wouldn't the mayor look at those department accomplishments and pick what he believed to be the top 10 accomplishments for 2011 from their list of accomplishments? A statement of accomplishment usually spells out the completion of something, a successful performance of something specific, a fulfillment of an objective, the attainment of a goal. It is a specific statement of achievement of a goal/objective. All that business acumen and you get a top ten list of grandiose, feel good statements. What we got from the Mayor's Top Ten Accomplishments was a generic list of feel good statements. Here is but one example of the hyperbole in the mayor's press conference - Our city’s heartbeat is pumping stronger. Downtown Sioux Falls is on the move. What was done to make the city's heartbeat pump stronger? What has been achieved to prove the statement, Downtown Sioux Falls is on the move? What the heck does this statement mean? It sure isn't a statement of a specific performance based action. Broad statements with no specific performance achievements are not accomplishments. A statement that "our people care" is not an accomplishment. Our foundation is rock solid is not a performance based statement of fact. Good grief, where is all that business acumen that is supposed to be self evident. Each city department has made significant accomplishments towards their goals and objectives. Congratulations to them for their hard work and their performance. They are the ones who accomplished much as is evidenced by their statements of achievement. The directors, at least, have the business acumen and understanding of how to quantify an accomplishment. I did not see one statement on the Mayor's list that he can list as his top accomplishment as mayor. This list is stupid and not worthy from the office of a mayor. A lot of fluff and no substance behind the verbose speech and big smile. The constant fight over the role of the mayor and the role of the city council is an old fight started back in 1995. Each mayor has chafed against a city council who has wanted to be more involved in the administration of city government than the city charter allows. 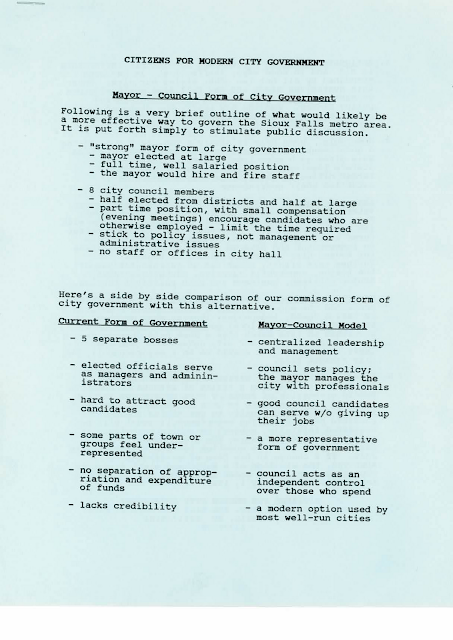 When the new form of government was effective in 1995, the city attorney held many training/educational sessions on the city charter and the roles of government. When a new councilor took office, orientation sessions were held giving newly elected officials background and history regarding this new form of government. As years progressed, people left and orientation sessions regarding the city charter and the mayor and council roles went by the wayside. Pretty soon, the "old" experts on the city charter were gone and everyone was pretty much left to their own ideas on who should be doing what and what the roles of the mayor and the city council should be. Over the years, the city council has crept into the executive and administrative role of the mayor. It is easy for people to bicker about the roles government by engaging in the personalities of mayors and city councilors when those personalities lend to the debate. But when we allow personalities into the debate, it clouds what the city charter says each branch of government should be responsible for. When the mayor and councilors cannot get along, that dislike or irritation flows over into the roles of each branch of government and pushes one branch to create ordinances to encroach on the powers of the other branch. That's what has been happening since this form of government took effect in 1995 and it will probably continue to be an ongoing source of discontentment and encroachment of power. The city charter is clear. Section 2.01. General powers and duties. The mayor oversees the employees. The council establishes a personnel system by ordinance. The mayor prepares the budget. The council holds public hearings on the budget and approves the budget by ordinance. The mayor prepares the 5 year capital program and the council approves the capital program. The council approves the appropriations for the budget. The council has the authority to amend the budget and the appropriations. In other words, the council has the purse strings. The council has the final say on taxpayer money and how it should be spent. It says so in the city charter. But the council wants to get involved in the day to day business - the management and administrative side of the city government. So says, the mayors. And so the arguments and the grabs for power continue. The city council has certainly expanded it's branch of government far beyond the "part-time, policy making and legislative body, avoiding management and administrative issues" by creating an administrative department of their own. They have added staff beyond the "city clerk" operation of managing the official records of the city. The council has created an Audit division of 3 employees, a budget analyst and now a legislative and operations manager. They now have executive and administrative power of various appointive and civil service employees of their own. The question is, does the city charter allow for this expansion of power? The city attorney, as the legal officer of the city is the true gatekeeper. If the city attorney sides with the mayor, the council says the city attorney is in the pocket of the mayor. If the city attorney were to side with the council, the mayor would view it as betrayal. Yet, it is the city attorney who carries the ultimate authority regarding the power roles of each branch of local government. And if the city attorney cannot be neutral or unbiased and preserve and interpret the general powers and duties of the city council and the executive power of mayor, then you will have the continued bickering about the power roles of the mayor and the city council. Both branches of government are guilty of mudding up the city charter and wanting the language to change to better empower their positions. The power to govern is already there. Instead of trying to grab more power, both branches need to just do their job as the citizens elected them to do and quite coveting the other's power. It's a balance of power. The City Charter recognizes the balance of power. I wish the elected officials would do the same and the city attorney would do his job. The City Council has been working on their organization structure since they fired Debra Owen back in September 2011. The council formed an ad hoc committee in November 2011 to decide what they wanted their city clerk position to be. I wrote two blogs on the subject in September and November 2011 suggesting that maybe it was time to finally create two very distinct positions. Vice Chair Erpenbach presented the new organization structure under the emergency clause of ordinance 2-15 at the Tuesday, January 17, 2012 council meeting. The current organization reflected Owen's old position of City Clerk/Chief of Council Operations and 3 Assistant City Clerks. The new organization will have a new position titled Legislative and Operations Manager, a City Clerk position, and 2 Assistant City Clerks. The rationale for creating two positions from Owen's position at the time of her firing was that the City Clerk serves the entire city and they wanted it to be a neutral position, an apolitical position. The new position titled Legislative and Operations Manager would specifically serve the 8 councilors. Councilors need someone to bounce ideas off of, someone to do their research, set up meetings and run the day to day operations of the council office. Having two separate and distinct positions is not a brand new idea. It was being discussed as an option back when I was still working for the city. If you talk to Owen, she was also working on the concept. It is not a new idea but it is a good idea, in my opinion, and it is finally being adopted. How it was adopted is another story (see January 19th blog). Maybe now, the council can keep the mayor out of their day-to-day council business and the City Clerk position will truly be a neutral administrative position serving both the council and the mayor's administration. Too bad it wasn't done when Owen was still there. She might not have lost her job to political circumstances. Councilor Erpenbach's committee also created another council committee called Operations Committee made up of the Council Chair, Vice Chair, immediate past Chair and another councilor approved by the city council. This committee will oversee these positions and incumbents and the day to day operations of the council office. As a part-time council, this will continue to be a challenge especially since by charter the council is only supposed to be a part-time, policy making and legislative body. Erpenbach said the two positions would be posted and applications would be taken from both inside and outside city government. The mayor congratulated Erpenbach on not adding to their headcount. An interesting comment considering there are currently 3 Assistant City Clerk incumbents. Either one of those 3 is predisposed to getting promoted to the appointive City Clerk position or one of them is going to be fired or laid off since the new organization only allows for 2 Assistant City Clerks. Rumor has it that the mayor is working on changing ordinance language in Chapter 30 pertaining to personnel rules and regulations related to appointive officials and employees. Current ordinance language specifically allows appointed officials who have previous civil service to "bump back" if they become unappointed by a mayor and/or city council. Of course, this language amendment would require a majority vote of the city council. Why any of these civil service assistant clerks would take the city clerk position with the prospect of losing the ability to bump back when they lose favor with the mayor or the council is beyond me. All they have to do is look at the "special" way the mayor and city council chose to treat Debra Owen. Then ask yourself why you would leave civil service to work for this group. Every day is a wing and a prayer regarding job security. New Council Organization an Emergency? Agenda Item 21 which was 1st reading of an ordinance to amend the campaign finance laws. Agenda Item 22 which was a resolution to create a new position titled Legislative Operations Manager and establishing a salary range of $2,292.80 to $3,300.00 bi-weekly. Agenda Item 23 which was a resolution revising the position of City Clerk with a salary range of $1,936 to $2,727.20 bi-weekly. It is interesting to note that Agenda Item 21 was actually listed on the regular agenda along with the ordinance language document for public view. However, the Regular Agenda did not list Agenda Items 22 and 23, nor were the resolutions on the city's website for view by the public. Council Vice Chair Erpenbach made a motion to add these three agenda items to the regular agenda and Council Chair Aquilar seconded the motion. In order to act on the immediate action by Councilors Erpenbach and Aquilar, the action required an affirmative vote of at least 6 councilors. Everyone present voted yes. Agenda Item 21 addressing changes to the campaign finance laws was vetted by Interim City Clerk, Sue Roust, at the January 9th Public Services Committee meeting . She publicly requested that the ordinance amendment be carried in after the deadline and gave her rationale for requesting the immediate consideration of the ordinance amendment. The Public Services Committee approved the action to carry it in at the January 17th meeting. There was no discussion of the Council Reorganization or carrying in agenda items creating a new council position or revising the current city clerk position at that meeting. There was no motion by the Public Services Committee to walk in Agenda Items 22 and 23. Below is city ordinance language that speaks to agenda submissions and deadlines. The submission requirements are necessary to meet open meeting laws and public notice requirements. Sec. 2-15. Agenda. (a) All reports, communications, ordinances, resolutions, or other matters to be submitted to the council for consideration shall be delivered to the city clerk's office no later than 10:00 a.m. on the Monday one week prior to the council meeting. If the Monday one week prior to the city council meeting is a holiday, the deadline is 10:00 a.m. on the preceding Friday. All documentation requiring council action will be delivered to the city clerk's office in its complete and final format. The city clerk's office shall prepare the agenda in both paper and electronic format and will furnish each member of the council, the mayor, and the city attorney with access to the information after 1:00 p.m. on the Wednesday prior to the city council meeting. (b) During consideration of new business, the mayor or any two city council members may bring before the city council any business that person feels should be deliberated upon by the city council. These matters can be added to the agenda by a vote of six city council members and will be considered under new business. Formal action on such matters shall be deferred until a subsequent city council meeting, unless consideration is necessary for the immediate preservation of the public peace, health, or safety of the municipal government. If the city council chooses to take immediate action on the newly calendared agenda item, and notice to the public is provided as set forth in SDCL 1-25-1.1, an affirmative vote of six members of the council is required for approval. Why did the Council Vice Chair and Council Chair carry in Agenda Items 22 and 23 relating to the Council Organization? Certainly the consideration of these two items do not rise to the level necessary for the immediate preservation of the public peace, health, or safety of the municipal government. Yet, the council chose to take immediate action on these two council positions at the meeting on January 17th in spite of this ordinance requirement and no public notice. The city council had just revised ordinance 2-15 back in July, 2011 to stop this kind of thing from happening. It went through the Public Services Committee which sent the revision to the City Council for adoption. Now, it seems, the council is breaking their own rules of law. It is preposterous to think creating a new council position and revising a current job description was an emergency. This action was not vetted properly through their own committee structure and it violated their agenda ordinance language. It seems they can't even follow their own rules and begs the question what else don't they follow? Open meeting laws and public disclosure and notice requirements are not supposed to become cavalier or a sometime rule. The Council leadership and the rest of the council just proved that anything goes when you want to get something done. Pretend it is an emergency and hope no one notices. What the heck is going on with city government these days? Change with a capital C. I actually like change. I believe in change. But and there is a big BUT, change to further one's agenda, to stifle or restrict public input or access is change we don't need and is not good public policy. Change needs to be well thought out, researched, debated, public input, reviewed AGAIN and AGAIN, before change affecting public policy is adopted. What we have seen this past month or so is proposed change that appears to be knee jerk reactions to noisy and persistent citizens and irritating councilor actions. When public officials take things too personally, you start getting ineffective change that makes for poor public policy. This mayor and council is like a perfect storm of reaction and counter reaction instead of effective, thoughtful and meaningful public policy. Being in the public eye is not always comfortable. It's not always high five moments, clapping in adulation over how wonderful one is, kudoos for a job well done. Being in politics can get tiring and sometimes, one's feelings can get hurt. Scrutiny about everything one does and what one says sees the light of day and is commented on. That's why holding public office means you are in the public eye - all the time! Section 2-16. Addressing the council; time limit. (a) During the public input portion at the start of a city council meeting, no person shall be permitted to speak on a topic that appears later in that meeting's agenda if public input will be received when that agenda item is up for discussion. During public input, city council members are not permitted to engage in a dialogue or discussion with the presenter. Really? What is public input for if it is not a time to allow a citizen an unfettered, uncensored time to address the city council on any issue. Biting one's tongue during or after public input at a council meeting is exactly what a public official needs to do. No matter how irritating or tiresome that public input may be. After all, the mayor and the city council have all the advantages of public comment. They have the bully pulpit ad infinitum. So, when things get tough, or you don't like something that is happening to you, propose a change. So how about changing the public input from the beginning of the council meeting to the end of the council meeting. Yes, that's the ticket! Let's punish those tiresome citizens who want to have a little say in their local government and make them sit through the entire council meeting. When will the ridiculous proposals of change ever end down at City Hall and Carnegie Town Hall? ..........Huether said it’s up to councilors because the meetings are theirs. And while he said he “loves” that the community can have dialogue with its officials, it can get old. That's right, it is a democracy. As a public official, whether you find it tiresome or a little old, it is your job to bite your tongue and let the citizen have a little public input. That's why it is called public input. When public input from a citizen becomes a little tiring and gets old is the time for you step down as a public official because you have forgotten that it is not about you. If you don't like the heat of public scrutiny, input and debate, then get out of the kitchen of political office. It is about democracy! Joe Kirby was one of the original authors of the City Charter drafted in 1994. 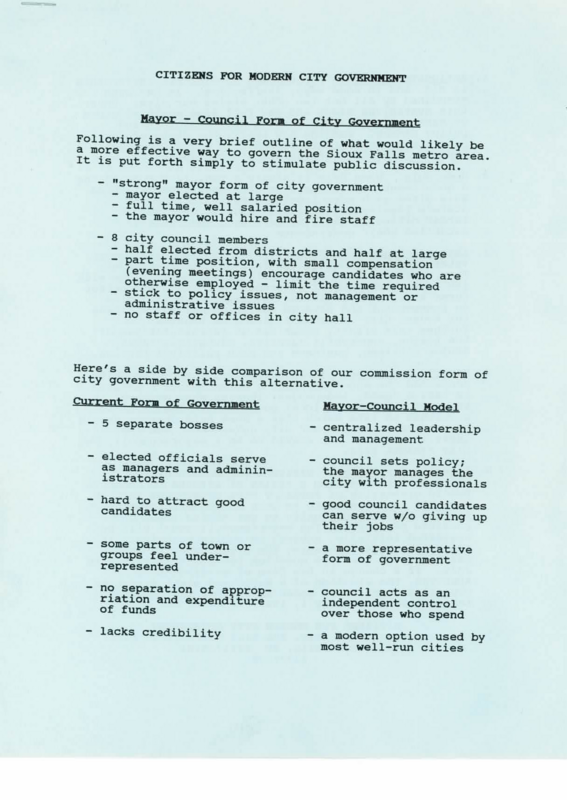 He and others spoke to numerous service groups to sell the idea of a change in the form of government from a full-time commission to a mayor/council form of government. The executive and administrative power of the city shall be vested in a mayor. The mayor's executive and administrative power shall include, but not be limited to the following: appointing directors, hiring employees, supervising staff, disciplining employees, terminating employees, negotiating and awarding contracts, supervising the delivery of services, administration of the budget, administration of the Capital Plan, preparing the budget, preparing the Capital Plan, assignment of duties and responsibilities of staff, and enforcement of city ordinances. Isn't it interesting that back "then," Kirby's side by side comparison stated that the council acts as an independent control over those who spend? So, why add all this language that now includes the language "negotiating and approving contracts?" Especially after the council took official action to approve contracts against the position of the mayor. It sure seems a little suspect that Mr. Kirby pops back up right after the city council acts to approve contracts at a regularly scheduled city council meeting to push the mayor's agenda which was is in disagreement with the city council. Joe Kirby's then and now - why now? Pleading ignorance about the goings on of the Charter Revision Commission. Unaware of who contributed to his campaign until a reporter told him. Unaware of what language related to city ordinance is drafted by his city attorney. Pleading ignorance from a person who said he has a google alert on his own name. Pleading ignorance when actually recruiting people to serve on city boards and commissions. Pleading ignorance about what the Charter Revision Commission is doing when he stated on the December ASK THE MAYOR program the Charter Revision Commission should look at the roles of the mayor and the executive branch and the city council and the legislative branch. Pleading ignorance and being unaware is hard believe from a person who is so totally engaged and immersed in the job of mayor of this great city. Not being aware of what is being drafted out of the city attorney's office is not being engaged in the legal affairs of the city. Pleading ignorance and being unaware are two phrases that are not descriptive of this mayor. So why plead ignorance or say one is unaware? When you don't want to be accountable for one's actions. I have always loved to read a newspaper. No matter where I traveled, I would pick up the local newspaper to get a pulse on community and local government issues. I read with interest the ARGUS LEADER's announcement from Publisher Randall Beck that the shift to their new subscription model is based on the principle - The high-quality content created by our exceptional journalists informs, inspires and entertains in ways nobody else can match. And our pledge, in this fast-paced world, is to deliver that powerful journalism seamlessly across multiple platforms — web, mobile, tablet and your choice of print frequency. The backbone of this effort, months in the making, has been a rethinking of, and reinvestment in, our news coverage — not only the issues we cover, but when, how and where we cover them. I guess the backbone of the effort to move towards this change of rethinking and reinventing in news coverage included the forced furloughs of the very reporters who write the news and are the backbone of any newspaper. As I have said before, I understand the shift to charging for digital access. Newspapers across the country have to rethink and retool their business model. However, when I pay for digital access, I expect quality reporting and extensive news coverage. I subscribe to various news sources and enjoy the ability to get digital access on my iPad and iPhone on the go. But I subscribe with choice based on value on the news content of the subscription. Publisher Beck goes on to say: Ours, however, is unique in the industry because it begins with the fact that our newsroom — representing the largest and best team of journalists in the state and region — produces the best local content that is delivered where, how and when you want it. Nobody else does that. The very news Publisher Beck is talking about must be different and more compelling than what I can get from local television news, city's website, and other national news sources. Why not highlight the paper's political reporter, Jonathan Ellis or local government reporter Megan Luther. Sports Editor Stu Whitney's perspective on the local scene is not going to cut it for me. He's the best the paper has to offer in the new change? Time will tell if the Argus Leader Media Publisher and President Beck and Executive Editor Maricarrol Kueter will make good on the promise to provide the valuable watchdog journalism and investigative reporting that you have come to expect. I hope they provide the reading public a grace period to see if, in fact, they are capable of producing "valuable watchdog journalism" and "investigative reporting." Let's see if that 800 customer service number has received attention as well since it has been a past exercise in futility and frustration. I am not ready to plunk down my credit card just yet. The mayor and his administration and the Charter Revision Commission have been busy proposing sweeping changes to various policies and ordinances of the city. Numerous important proposed changes are before the Public Services Committee regarding the ethics ordinances in City Ordinance Chapter 12 1/2, city council organization and procedures in City Ordinance Chapter 2, fraud policies coming out of the Audit Committee, recodification of ordinances, etc. There is a another ordinance revision up for consideration at the City Council meeting on Monday, January 17th. The first reading pertains to revisions of Chapter 14 relating to campaign finance for municipal elections. This ordinance amendment was first on the January 9th Public Services Committee agenda. Interim City Clerk Roust stated some of the pieces of this ordinance were just given to the committee at this meeting (relating to the proposed ethics and fraud ordinance and policy) so the councilors on this committee never had to chance to review those fraud/ethics provisions added to this new ordinance revision in advance. Roust stated that these changes would hit during an election cycle "which is a bit troubling" but went on to talk about the rush to get this on the Council Agenda the following week as a walk in. When concern was expressed by Councilors Anderson and Brown regarding the rush to pass, City Attorney Pfeifle informed them the current ordinances were unconstitutional due to a recent Supreme Court Decision. The concerns folded like a house of cards. Why would you bring sweeping changing to campaign finance laws months before a city election? From what I am told, the last time changes were made to the campaign finance ordinances, it took the Public Services Committee months to review the changes and to hear public input. Those changes were considered six months or more before any election took place. Interim City Clerk Roust said unfortunately its the 1st time she has been able to look at it. City Attorney Pfeifle said the committee needed to take advantage of Roust's extensive expertise in election matters at the county while they can. The campaign financing ordinance amendments will have 2nd reading on February 6th and after publication and 20 days will become effective on March 1st. However, candidates can begin to take out petitions for the city council race beginning January 27th. The deadline to submit those petitions is February 24th. Councilor Brown is term limited, but Councilors Anderson, Karsky and Jamison will probably be running for a seat in the April election. They will be now asked to vote on sweeping changes to the campaign finance ordinance when they will actually be part of the petition process. When asked if it was conflict of interest, City Attorney Pfeifle said no. Does that really pass the smell test? The City Attorney may not have a problem with it but from a perception standard, it should certainly raise eyebrows. I guess all one has to do is throw out the scare of unconstitutionality to get something on the city council agenda that has had no public input in committee and has had no real study by the Public Services Committee. It is an interesting way to run the people's business. I don't know about you but there seems to be something stinky going on about who told who what when. On January 5th, KELOLAND TV ran a story on Charter Revision Commission working to define and expand the mayor's executive powers. The Charter Revision Commission is a mayor-appointed citizen board who began meeting last month. The group is charged with submitting suggestions to change the city's governing document. But a recent decision that defines and expands the mayor's executive power took the city council by surprise. “You've got good people on those committees, on these public boards, and you let them do their work and serve the public as best they can,” Sioux Falls Mayor Mike Huether said. Huether said that's what he's been doing since he appointed the board, and he had no part in the committee's decision. He may not have a part in the committee's decision, but that doesn't mean that he hasn't given them his input. Like I have said in previous blogs regarding this charter revision commission debacle, it is hard to believe that the mayor has not talked to anyone about his thoughts on the mayor's executive powers. Lo and behold, he actually talked about the work of this very commission in the December Ask The Mayor segment. When a comment was made that there was lots of opportunity for public input, the mayor said, "They can speak and let their voices be heard." Obviously, that word did not get out to Aanenson and his fellow commissioners when they closed Councilor Jamison down from providing public input. The moderator asked, "Anything specifically from you as mayor that you want to see changed in the charter?" The mayor responded as follows: "Oh boy, you know, I do think that we do probably need to look at those roles and responsibilities of not only the mayor and the executive branch but yes, the council and the legislative branch as well. I think that if they could look at that even more that's an important thing, but ultimately it's not going to be me that decides. We've seen over the years how maybe there's been some issues that should be looked at again." Who told who what when? Who is in the driver's seat? You be the judge. I agree with the editorial. However, if the Argus Leader had bothered to send a reporter to last night's meeting, it would know Public Works Director Mark Cotter asked for this item to be pulled. The Council voted unanimously to table the issue. The City Council had two major pieces of legislation on their agenda Monday night (January 9th). One was an ordinance changing the day when council meetings are held along with other council procedure changes. The other ordinance was the push to sell the Slip Up Creek land. Both actions have been covered in past AL articles and both have become controversial. Both items were deferred or withdrawn until a later date. Unfortunately, the ARGUS LEADER couldn't send their political reporter, Jonathan Ellis, to the meeting Monday night because he is on a week long forced unpaid furlough mandated by the paper. I guess there weren't any other reporters handy to cover the news of the city. So, the business lights of reporting the news goes dark. The largest newspaper in the state of South Dakota and it is furloughing its reporter staff one by one. And they wonder why they are losing readership. I have to give this mayor credit when credit is due. He knows how to play the publicity game at City Hall. There has never been a mayor who has pushed out more press releases on everyday business goings on like he does on a daily basis. That is not a bad thing as long as the steady stream of pablum from 9th Street is interesting and informative. And sometimes it is and sometimes it is pablum. On January 3, 2012, the mayor's special projects coordinator presented the city's top 10 project list to the city council. She stated this list was not all inclusive as there were many projects she was tracking as well as projects the departments were doing on their own. What was interesting, at the conclusion of the presentation, there was nary a question regarding these projects. The only question was would the coordinator be back for updates or would the information be posted online. Projects on the "Top 10 List" that we haven't heard a lot about at City Council Information Briefings are the Health Department initiative to push forward a plan to reduce community heart disease, cancer, stroke, and diabetes by 5%; the Pension Plan project to reduce the city's contributions rates by reducing the employee pension benefits; or the new software projects related to finance, land management integration and online plan review & work flow. All the other "top 10" projects have been on the information radar for quite some time. Project management was happening long before the mayor's special projects coordinator came on board. The Engineering Division of Public Works is the master on project management. . Major projects "sponsored" by various departments with departmental "project managers" have always existed in city administrations. The directors and management staff have always performed project management duties. So let's not start beating the drums of mayoral accomplishments at business acumen again. Project plans, summaries, milestones, risk planning process, dependency planning process, project sponsor, project manager - all fancy terminology to show something new is happening down at City Hall when it's really not new at all. I looked for the Top 10 Project List on the city's website but it is not posted yet. It probably has something to do with that "outdated software" issue. Personally, I like the fact that I will be able to go online and track progress on major projects in the city at one location on the city's website. That's what's new. What's not new is project management where directors and former mayor's used their Chief of Staffs to do the same thing internally. How nice of the mayor to make sure "regular joes" are appointed to the various boards and commissions. I am not sure "regular joes" should be appointed to some boards/commissions. Some of these boards/commissions are highly technical and need people with knowledge, background and experience in the area the board oversees in order to serve with distinction. It is dangerous to put people on boards/commissions with no expertise or credible knowledge in a specific area. The mayor went to great length to call out ordinary citizen Tim Stanga for his public input at the City Council meeting on January 9th. The mayor said it was "incredibly unfair to say its not an open process. It is true this mayor has made aggressive efforts to advertise openings on various city boards and commissions through press releases and advertisements in the local newspaper. However, the mayor is the one who still reviews the applications and decides who to recommend for appointment. When I retired from city government service, I wanted to give back to the city by volunteering my time to serve on two boards that I felt I could provide credible and knowledgeable service. I immediately put in applications to serve on one of the two pension boards and the charter revision commission. I have never received so much as a letter or contact of interest regarding my applications. I also know of others who would have been credible and knowledgeable volunteers for the Charter Revision Commission who were also not contacted by the mayor's office. Incredibly fair? Unbiased appointments? I think not. I do not view the current membership of the Charter Revision Commission as "regular joes." Two have political ties to the mayor. Two have professional contracts with the City of Sioux Falls and do business and receive remuneration from the city. I would like to see the mayor publicly identify the criteria he uses to identify and evaluate the "regular joes" he recommends for appointment to city boards and commissions. What criteria does the city council use when they give their advice and consent to the mayor's appointments? It appears it is just a rubber stamp process. Andy Traub said it best at the city council meeting on January 9th. Parliamentary procedure should not be used to stifle public input and submission of proposals to the Charter Revision Commission. Why didn't the City Attorney speak up and advise the Commission that they were acting inappropriately by silencing the voice of a city councilor? Councilor Jamison was treated with great disrespect by Commission member Aanenson. Commission member Thimjon seconded his blatent misuse of parlimentary procedure to silence Councilor Jamison. The other members followed like sheep. Councilor Entenmen is right - people who serve on city boards and commissions should be commended for their volunteerism and service to the community. However, board/commission members do not deserve recognition and commendation when they act to circumvent free speech and stifle public input by using parliamentary procedure in such an irresponsible and highly suspect manner. Words are cheap. It's one's actions and how they conduct themselves in the public eye that establishes credibility. The current Charter Revision Commission has lost credibility by their actions. Frankly, I think this Commission should be disbanded or the members should resign and the Mayor and City Council should reappoint a brand new Charter Revision Commission. Why is the Charter Revision Commission on such a fast track to get charter amendments ready for a public vote in April 2012? Maybe it's because this latest charter revision commission wasn't appointed until late 2011 and there is an agenda. Sec. 2-41. Duties; public meetings. The commission may deliver a report to the city election authorities framing and proposing amendments to the Sioux Falls Home Rule Charter which it deems advisable. The commission shall hold at least one public meeting each calendar year for the purpose of receiving recommendations from the public regarding revisions to the charter and to take action upon any matters before the commission relating to proposed charter revisions. Charter Revision Commission members are appointed by the mayor, upon advice and consent of the city council. They serve 3 year terms. That usually means that the current mayor gets the opportunity to appoint a new commission every new mayoral term. It is something that just needs to get done procedurally. The last Charter Revision Commission member terms expired June 2010. In spite of what is directed in the charter, this mayor did not appoint a Charter Revision Commission until late 2011 forcing a very fast timeline to get anything on the spring 2012 ballot. That's not to say that something needs to be on the Spring 2012 ballot. This commission has a lot of proposals before them and they seem hell bent on getting these proposals on the April 2012 ballot with little to no public discussion. According to the 2010 Annual Report, the previous commission, which was appointed in 2007 by former mayor Dave Munson, held 4 meetings in 2008, 5 meetings in 2009 and 4 meetings in 2010. The commission delivered 2 proposed revisions to city election officials for the April 13, 2010 ballot. Previously, voters have approved revisions to the city charter in 1996, 2000, 2004 and 2008. So why the rush to get all these proposals on the April 2012 ballot without a meaningful study and public discussion? Why the rush to amend? Shouldn't amendments to the charter take time to study, discuss, and research all the implications of the changes? Why rush to put these latest amendments on the ballot after only two shallow meetings where no substantive discussion took place? The ink on their appointment to this commission is barely dry. Commission member Gregerson is right when he says there is a concern that there may be too many amendments on the ballot which will just confuse the voters. This commission has until October 2014 to study the charter and make recommendations for revisions. At least two of the current commission members are known "contributors" of the mayor. Thimjon and Aanenson certainly showed their "home team colors" at the January 4th commission meeting. The Charter Revision Commission should be made up of members whose agenda is good government, not to promote the agenda of a political crony. Their water carrying antics were so transparent we all got wet. What we saw on January 4th, was political cronyism and payback and unsatisfactory performance by a supposedly neutral charter revision commission. Poletes, Knudson and Gregerson need to get some you know what or this entire commission will go down as one of the most outrageous and politically motivated commissions yet. We Have Enough Water - At the Moment. Once again, we see that the current Administration is not into long term planning. The latest short term sightedness is illustrated in their agenda to sell land the city has been methodically planning and buying for the past several decades. The administration wants to sell the Slip Up Creek watershed northeast of Sioux Falls. At one point, Slip Up Creek was identified as a future reservoir area for City water needs. However, following the emergence of the Lewis and Clark water project, the reservoir is no longer being considered for that purpose. Instead, the Slip Up Creek area should be preserved as a rural agricultural area. In the later half of the growth horizon, the southern section of the growth area will urbanize. The Slip Up Creek floodplain area should be protected, and existing City-owned parcels in the floodplain should be preserved as flooding buffer and future park area. So, why sell the land now? Well, for one thing, that land will bring in $2.4 million dollars to go back into the water fund to help the water rates. Short term thinking. How do we know that the money from this sale won't be used to deal with the water issues at the event center construction site? Once sold, gone forever. Once put into the water fund, spent forever. I have an extended family of farmers who say never sell the land. I agree with former mayor Gary Hanson when he says the city is making a mistake giving up on Slip Up Creek. Why even the city's own comprehensive plan says the existing city-owned parcels in the floodplain should be preserved as flooding buffer and future park area. Once that land is sold, it is gone forever. Land is gold and holds the future to this city. Think of the long term uses for this land. A possible reservoir for recreational use? Forward quality of life thinking for this community. But it appears this administration lives in the moment. At the moment, selling the land means dollar signs and using it for short term water rate relief is an "in the moment" mentality. I hope the City Council has some sense to stop this proposed sale. The Charter Revision Commission met on January 4th. Charter Revision proposals have been submitted by the City Attorney, the Director of Finance, out of town citizen Joe Kirby, and Councilor Jamison. This was a painful meeting to watch. The chair does not appear to understand or know anything about parliamentary procedure and the City Clerk and City Attorney didn't do anything at the beginning of this meeting to help clarify how this process should work. Interim Clerk Roust finally spoke up but, my goodness, this was like watching water boil. Painful lapses of silence, tentative direction from the chair, and silence from the board. Run these meetings like a council meeting. The proposals weren't read publicly even though the Assistant City Clerk attempted to correct the chair's omission to do it. The city charter established a strong mayor, weak council form of government and it has been contentious between these two bodies every since regarding what they roles should be. The "tweaking" of charter language by the administration and the council attempts to deal with the strong mayor, weak council concept. Granted, some proposals are not substantive, just technical changes. But each proposal deserves in-depth study and discussion because changes to a "constitution" are serious and could have unintended circumstances later on. I question whether in-depth study and discussion took place during this meeting. Who knows, maybe this group studied these proposals and discussed these proposals with the mayor or other councilors before they came to the meeting. I hope this group of citizens talked to someone because they are lay people who are not experienced in government or this charter. Proposals from Kirby and the City Attorney were passed with little or no debate and frankly, discussion only started once Interim City Clerk Roust got up and questioned what they were actually doing regarding Finance Director Turbak's proposals. Then we come to Councilor Jamison. His proposals come from past history and controversy with the Mayor. Board member Aanenson shut down Councilor Jamison and Thimjon seconded silencing City Council Jamison. Why such a disrespectful display of behavior? Whose water is Aanenson really carrying? Knudson didn't want to offend her fellow councilor so attempted to postpone it to another meeting. Aanenson shut her down. They all voted to shut him down except Knudson.Whether you agreed with his proposals or not, Councilor Jamison deserved to be heard and his proposals deserved a proper discussion. Shameful behavior towards an elected city councilor member. Pay attention to the business being conducted by the Charter Revision Commission. They will decide what charter language should be changed and submitted to the good folks of Sioux Falls citizens to vote on in April. This is serious business because it is the city's constitution. These people who were appointed to serve on this charter revision commission should be unbiased. I did not see that at this meeting and Aanenson was the king bully that day. He played the mayor's role very successfully. This meeting was just an extension of what goes on between the mayor and the city council. I have never been a fan of this form of government. Electing a lay person to be the "CEO" of city government is a crapshoot. This form of government promotes the kind of territorial in fighting that has been going on since it was voted in back in 1995. I think this city is big enough for a city manager form of government. Everybody has an agenda. Let's hope the agenda is good government. I did not see that at this meeting. It does not matter where you live in this country, you are going to read an article about the unprofitability of convention centers. We all heard about how profitable the Sioux Falls Convention Center was going to become with the building of a new Event Center. In Virginia Beach, Virginia there is a public controversy going on regarding the Virginia Beach Convention Center and the necessity to build a another luxury hotel to spur competition with cities like Savannah, Myrtle Beach, Charlotte, Richmond, Louisville, Baltimore, Raleigh and Nashville who have built hotels next to their convention centers. Their state of the art convention center is located approximately eight blocks from the oceanfront. Even with the oceanfront being a selling point, the convention center has brought in little more than half the visits from conventions and trade shows predicted in a 2000 study as reported by a Virginian-Pilot editorial. The Virginia Beach City Council wants to enter into a public-private partnership with a developer to build a hotel and more conference space. You know, that pesky floor space issue we heard so much about in the campaign. The proposed hotel would cost $102 million with the city paying $67 million up front. The city council says that money will not come from the "general fund." Sound familiar? The VB City Council is split 5-5 and the Mayor is expected to break the tie. Sound familiar? They say the tourists are going to pay for the hotel. Sound familiar? Virginia Beach has a "Tourism Investment Program Fund" which is similar in theory to our Entertainment Tax Fund. They charge an 8% hotel tax, a 5.5% restaurant meals tax, and 10% amusement tax paid on such things as going to the movies, playing golf, bowling, going to plays, etc. There's a cigarette tax, revenue from parking tickets - this fund has approximately 20 different revenue streams and pays off the debt service of many buildings and facilities in the area. Their "TIP" is being proposed to pay off the debt incurred with this new public private hotel partnership. Our ETF is going to subsidize the operating expense. The public outcry is that it is a joke to say it won't cost the taxpayers any money. They say they all pay some portion of the tourism tax. They eat out, they go to movies, they play golf - you get the idea. But it's the debt that worries taxpayers here and they don't like it when they read things like a stagnant convention business and the convention center business not meeting projections. They are saying the numbers don't add up. Sound familiar? America's convention center business has been declining, resulting in a nationwide surplus of empty meeting facilities, struggling convention halls and vacant hotel rooms. Governments have responded to the glut by building more convention centers, financed by debt backed by new taxes and fees on already struggling taxpayers. Optimistic projections about new facilities fail to account for how other cities are expanding too. The failure of these facilities to live up to exaggerted projections is nothing that hundreds of millions more in taxpayer dollars can't fix. It would be funny if it weren't downright ironic. Familiarity breeds contempt. It looks like the citizens of South Dakota will see a bill in the 2012 Legislature banning texting while driving and/or banning cellphone use while driving. I have to admit that when texting first became available, I texted while driving. I do not text while driving anymore and haven't for quite a long time. I have scared myself silly too many times to continue to do it. I do not support the whole cellphone use ban, however. I know that probably sounds like a wishy washy stance that doesn't make sense, but at least when a person is talking on their phone, their eyes are not down looking at their phone. I have hands link free system tied to bluetooth in my van that makes it pretty darn easy to answer the cellphone if it rings. The button to answer it is right on the steering wheel. My eyes stay on the road and my hands are on the steering wheel. The article in the ARGUS LEADER was interesting and in-depth in its coverage of the possibility of a cellphone ban in the Legislature this year. Both Sheriff Milstead and Police Chief Barthel make a lot sense regarding this issue. I would think law enforcement professionals should weigh in heavily on the issue when it comes before the legislature and they should be listened to as the experts. The careless driving statute covers it and enforcing such a law is nigh onto impossible. However, clearer heads have not been the norm with legislators in Pierre. If the legislators in Pierre want to ban cellphone use, then they should also include banning such activities such as turning your head to talk to your child or other person in the car, putting in a CD, changing the radio station, eating food in the car, putting on your lipstick, blowing your nose, sneezing where you momentarily shut your eyes, drinking coffee or pop, or looking at the person in the car next to you picking his nose. Really, how ridiculous a list do you want to make it? From a state which has always been about personal freedoms, this is a curious stance. But then why should it surprise anyone considering what the legislature did about the abortion issue last year which will end up costing the taxpayers millions of dollars. It will be interesting to see what develops regarding this topic in the 2012 Legislature. I say no to legislation on this issue. I agree with the Sheriff and the Police Chief. Why create a law you can't enforce when there is already a law on the books to cover it? Thanks to KELOLAND TV we now know why there is free hourly parking in the 1st Avenue Parking Ramp. City Director Darrin Smith said, "We wanted to make sure that, especially in the month of December that customers Downtown go shopping, visiting Downtown was as convenient as possible for them so we've allowed them to park in the ramp." Come on, if that was really the reason for not collecting hourly parking fees because of "a few setbacks in software issues communicating with the city's IT, then why not advertise the grand benevolent gesture back in late November when they knew the system was not capable of going live? Why didn't the city do a press release letting the general public know that they were going to give the Downtown shoppers a Christmas gift in December? It's not like they don't know how to do press releases since there is at least a couple press releases a day coming out of City Hall. What a great way to let citizens and visitors to our great city know that they could park for free while visiting and shopping downtown. Director Smith stated that the city parking lot delay is not costing the city money because it's saving money on the salaries of the people they let go. The hourly parking only brings in $50 a day, for goodness sakes. It's hardly worth the effort to collect the fees. If that is the case, it sounds like a nuisance fee to me. Maybe the Public Parking Facilities Board needs to just do away with that piddly, nuisance amount of revenue and let the shoppers and visitors park in the ramp free all the time. Oh and by the way, there is a nice new business-like sign up on the parking fee machine instead of that tacky grey tape covering the slot. It now says, Please proceed. Upgrades in progress. Another spin cycle out of City Hall after the cow left the barn. Mooooooooo!